Kirsten Kjær’s Museum opened the graphics workshop in 2001. The museum would like to serve as a place for courses and for single artists as well. The graphics workshop is first of all meant for graphic artists. 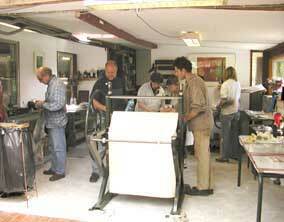 In order to use the workshop you should be familiar with the traditional printing technologies. Members: You can apply for a membership for 365 DKK per year. Members have free access to the workshop and have the possibility for overnight-accommodation at the museum (further details under: “Guest House“). We would like the memebers to dispose 1 to 2 prints to the museum for sale and achive. As a member you can also apply for a graphic exhibition at the museumsg graphic gallery (ca. 20 m) in the first floor from April to October. 10% of the sales would go to the graphics workshop. Visiting Graphics artists: Are asked to contribute 50 Dkk per day for use of the workshop and can arrange for accommodation with the museums staff. As with members, 1 to 2 prints are given to the workshop per press. Two printing presses with plates up till 80x120cm respective 50x60cm. A lithographic press for lithography. The workshop has a number of stones available. Etching bath, iron chloride to zinc. A separate department for photoengraving with a vacuum press up to max A3 format. The workshop is a bright ca. 80 m2 room with good workbenches. It is possible to book the entire workshop, if you need more space and would like to work alone.